Mafia Wars is a pretty dark game, so it would only make sense that it reflects on the darker side of the holidays with the limited time "Holiday Traffic" Secret Mission. Zynga introduced this short event mission recently for only you and four friends to take on, which tasks your crew with taking advantage of the crazy holiday traffic. That's extremely vague, but we're going out on a limb a guessing it means murder and pillage for profit and glory. If that sounds enticing to you, then take a look behind the break for a guide on this short-lived mission. To complete this mission you'll need the help of four friends to take over specific roles: a Driver, an Enforcer, a Sniper and a Fence. Remember, your friends' performance in these roles depends on their attributes, so choose wisely. Upon accepting the mission, you only have three days to complete it, so get crackin'. However, you're in it for the rewards, right? 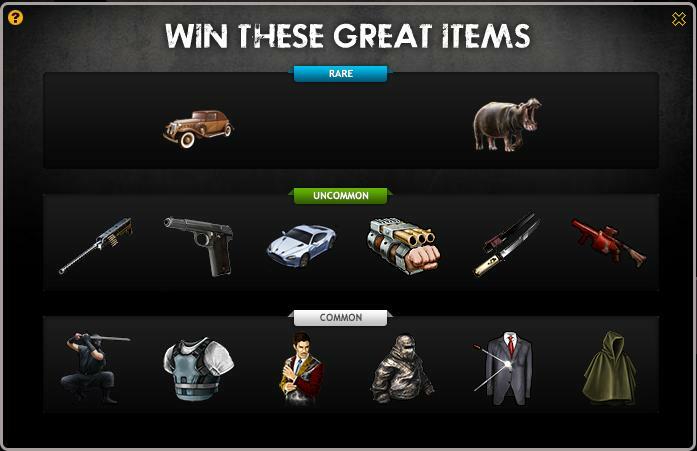 Well, there are quite a lot of items here to win, but even the rare drops are paltry at best compared to the items you can win in this weekend's gifting event, Serial Assassins. With common items like Traje de Balas only providing 10 Attack and 39 Defense and uncommon items like Injury Time packing a mere 38 Attack and 52 Defense, you'd think the Rare items would be seriously strong. Wrong. The first of the rare items, Roaring 20s, is a vehicle with 35 Attack and 62 Defense while the second is simply named Hippopotamus and provides 63 Attack and 43 Defense. Not exactly blowing me away, at least. Especially considering Secret Missions take far more coordination from fewer friends than gifting events. Whelp, at least it's something else to do this weekend. Just don't be too sad if you don't get a rare item--you're not missing much. Find the rest of our Thanksgiving coverage right here. Have you started this limited time Social Mission yet? What do you think about the quality of the rewards? Sound off in the comments. Add Comment.